The fate of many of the Notre Dame’s treasures is still unknown after the huge fire which ripped through the 850-year-old cathedral on Monday. Experts are today entering the wreckage of the Paris landmark to find which of the precious artworks and religious relics have been saved. The mayor of Paris said that one of the most irreplaceable items – the crown of thorns reputed to have been worn by Jesus at his crucifixion – was safe last night. But there are fears for the church’s 13th-century stained glass windows and its magnificent organ, while the wooden roof and ornate spire have gone. 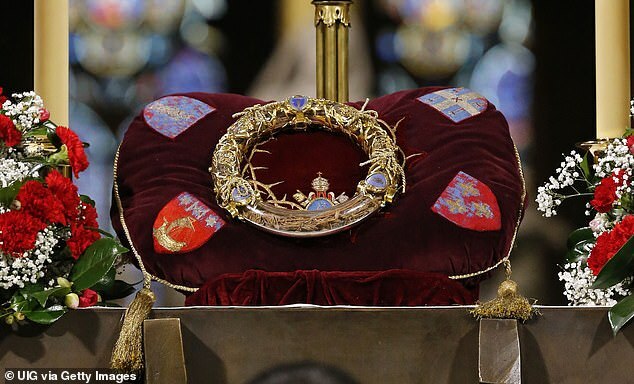 One of the cathedral’s most precious objects, a relic purported to be the crown of thorns worn by Jesus Christ on the cross, was whisked away to a secure facility. 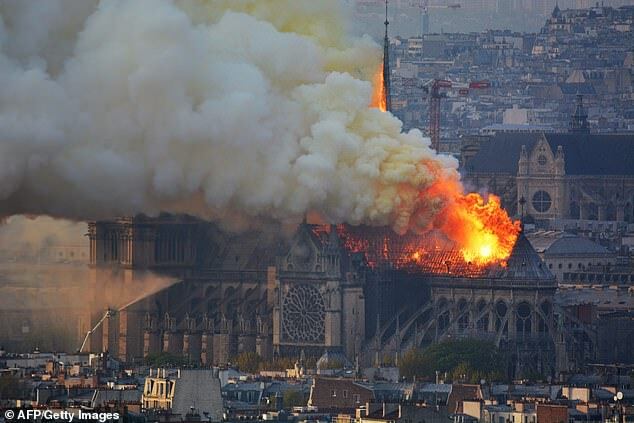 Reports in France stated that the chaplain of the Paris fire brigade had gone inside with the firefighters to save the crown. Experts said the irreplaceable item had been kept in a ‘very safe place’. A 13th-century linen tunic which is thought to have belonged to King Louis IX – canonised as St Louis – was also made safe, the mayor of Paris said. In his 44-year reign Louis took part in the Crusades and established early principles of justice such as the presumption of innocence. He was proclaimed a saint in 1297 – the only French monarch to receive the honour – and was responsible for acquiring the Crown of Thorns. Renovation was already taking place at the cathedral – which may have been linked to the fire. 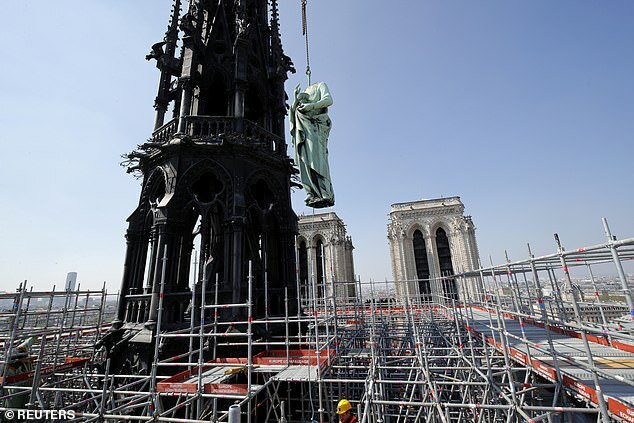 As part of that work, 16 copper statues were airlifted from near the now-destroyed spire just days before the blaze. This 1723 statue by Nicolas Coustou sits on the cathedral’s high altar. It shows Jesus being taken down from the cross after his crucifixion. 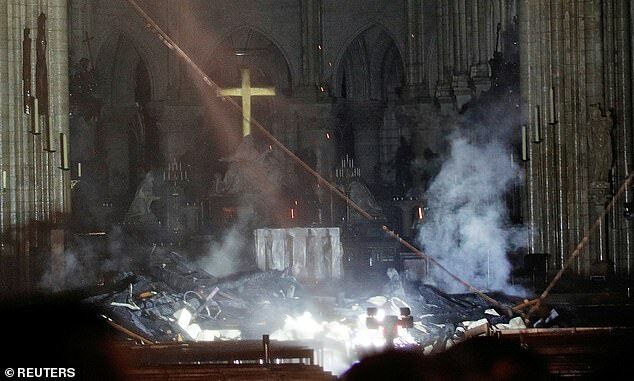 Initial pictures showed the cross still standing with part of the sculpture visible, although it was surrounded by smoke and debris. The bells that have rung out at key moments in France’s history were thought to be safe. The magnificent stained-glass artworks in the cathedral date back to the 13th century. 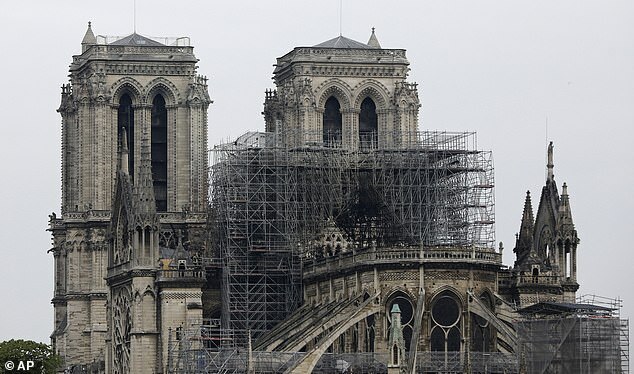 A French journalist at the scene last night said the north window appeared to be safe with no sign of broken glass although firefighters remained concerned. There have been conflicting reports on the fate of the other two windows but one picture this morning appeared to show the south one largely intact. 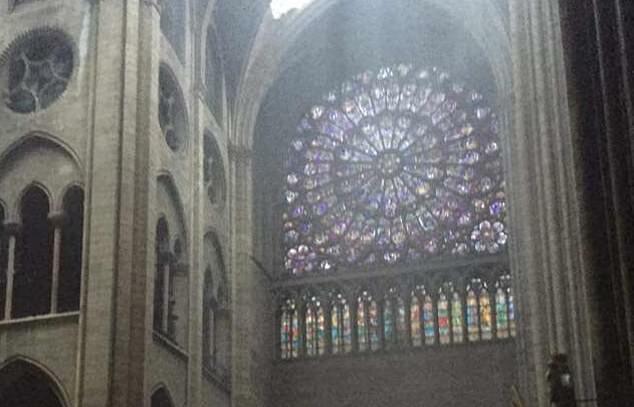 Architecture professor Julio Bermudez said the stained glass windows were ‘really irreplaceable’. 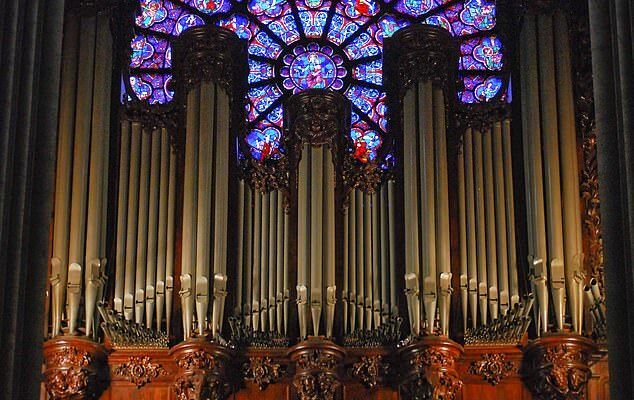 The status of Notre Dame’s grand organ was still unknown on Tuesday morning. The organ, which has its beginnings in 1401, was refurbished in 2013 when the cathedral celebrated its 850th birthday. Each of the nearly 8,000 pipes, some of which date back to the 18th century, was individually cleaned and returned to its place while nine new, gargantuan bells replaced the 19th century ones. 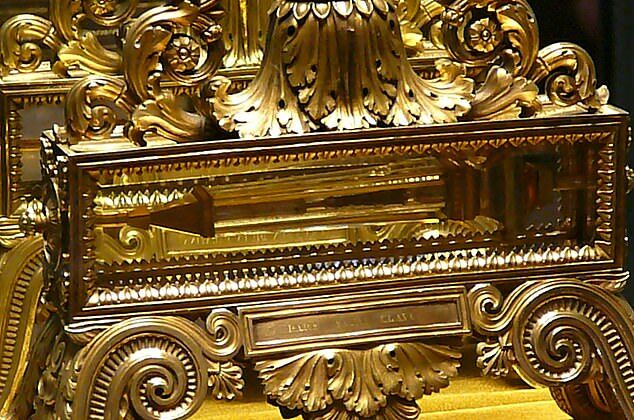 Another of the cathedral’s relics is a purported piece of the True Cross – the very instrument on which Jesus was crucified in the first century AD. The collection also includes a nail which is said to be from the cross. It was unclear on Tuesday morning whether these had been saved along with the Crown of Thorns. 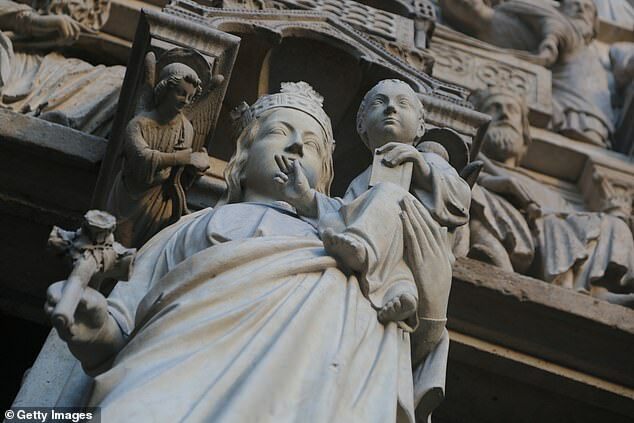 The 14th-century, life-sized statue of the Virgin Mary and baby Jesus is also known, like the cathedral itself, as Notre Dame or Our Lady. It stands near the Descent from the Cross sculpture which apparently escaped destruction but its own fate is still unclear. This sculpture begun in 1853 depicts St Denis, the patron saint of the city of Paris and a Christian martyr from the 3rd century AD. The statue in Notre Dame shows him holding his severed head after he was executed, but its fate today is not yet known. The cathedral’s wooden roof – built with beams made more than 800 years ago from ancient forests – was burned to ashes in the fire. A French cultural heritage expert has said that France no longer has trees big enough to replace them. 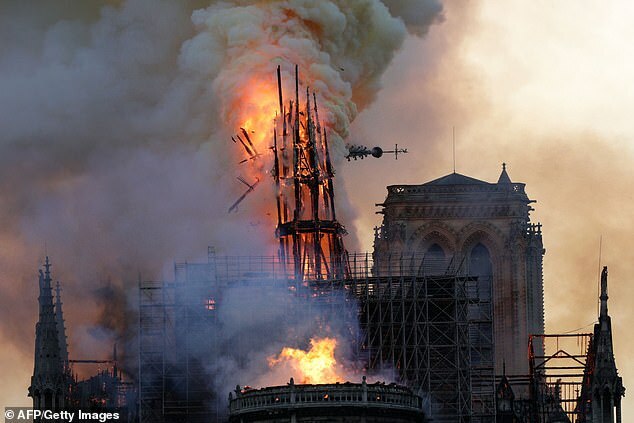 Parisians watched in horror last night as the spire burned and then collapsed in the intense heat of the blaze.